To address the full security compromise of the PSP, Sony has issued a new firmware that aims to defeat the user mode exploits available in 6.35 Hen, 6.31 Hen and 6.20 TN-A Hen. Important: If you have updated to 6.37 OFW, you can upgrade to 6.38 OFW to downgrade to a more useful firmware or upgrade to 6.39 OFW and install 6.35 Pro-B6. So why a PSA to not update? The new firmware simply patches out any exploits that we’ve been using and released to the public thus far without adding any useful functionality. So yes, it’s a security update to stamp out homebrew (and more). The good news however, initial reports indicated that a similar exploit that most of the current non-signed hbl uses is also available on the 6.37 OFW. Still to be on the safe side, don’t update. 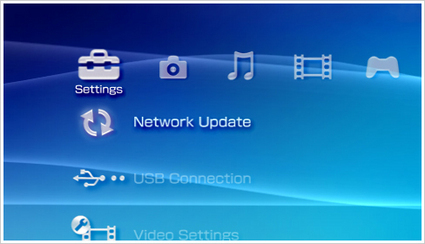 This is a minor update that improves system software stability during use of some features. is there a way to downgrade OFW 6.37 to 6.35 or below…. ????? how long shall we wait for the hack to 6.37 ??? does it take 6 months or more ?… or 2 months or less ???? cool….. ok… thanks…. i’ll keep on visiting this site..
There’s a Homebrew loader working for 6.37 but it’s not confirmed if the Prometheus ISO loader is working (obviously, no one is willing to risk upgrading just to test if it works on 6.37 or not :(). Just wait a bit, I’ll push out a post regarding that. Whoops, forgot to post the update :/ Will do when I get back in a few hours. any luck yet guys >_< ? whoops my bad. Real life caught up with me. so??? any hen or a way to get cfw with no pandora battery ? A Pandora battery will brick your PSP if it’s unhackable (it only works for PSP phat’s and older PSP slims) as for hen, still no word. i was having 3.87 fw on my psp, i updated it to 6.37, now can any1 plz tell me how to hack it? Please keep me posted for any hacked FW 6.37. Thanks. how to play iso games ,ve ‘ already downloaded many bt f no use..
pls help me out if u have any.. Creating a Pandora Battery requires a PSP with CFW installed. Since the PSP is 6.37, this isn’t possible. You can buy a Pandora Battery from any reputable online store however. at the 1st pace, i dont have any plan to update the psp, but thre is something wrong with it so i decided to update it. but i did not know dat 6.37 is not a user friendly version. GUys you can still play ISO games on a v6.37. how? download a iso 2 eboot converter google it. but th elimit is 750 mb for now. that’s too sad right? So far there’s no public exploit to re-enable kernel access on 6.37 which is why there’s no downgrader (like Davee’s 6.35 to 6.20 Downgrader) or an ISO loader :/ I guess the last sliver of hope is if Total_Noob releases a Hen for 6.38. He released a video of a working HEN with kernel access on 6.38 OFW a few weeks back :/ Let’s hope he releases it soon. Yeah TN did nothing Great for Davee and some1! there is a 6.38/6.39 downgrader to 6.20! I was able to go back to 5.50 Prome -4 thnks!!! That really doesn’t work for all games.